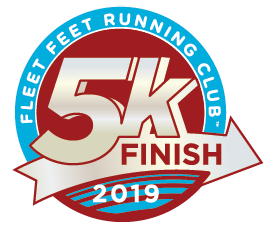 Fleet Feet Running Club Big Run 5K Starts April 6, 2019. Fleet Feet Running Club Wichita Big Run 5K Training is for beginner level runners and walkers who want to train for a 5K event. This program starts on Saturday April 6 and trains for the Big Run 5K on June 5, 2019 (National Running Day). We will have 3 groups including a run, run/walk, and walk group that will be inclusive of all individuals. Cost is $75 and will include a uniquely made schedule, training runs throughout the week led by individual coaches, store coupons, topical clinics, physical therapy screenings, and much more. Program Format Mondays - East 6pm, Wednesdays - West 6pm, Saturdays - Location varies 8am. Learn to Run 5K is offered 4 times per year. Summer 2019 5K details coming soon. Description: June 5th is National Running Day and Fleet Feet celebrates with The Big Run 5K! Come train to walk or run this 5K with us!